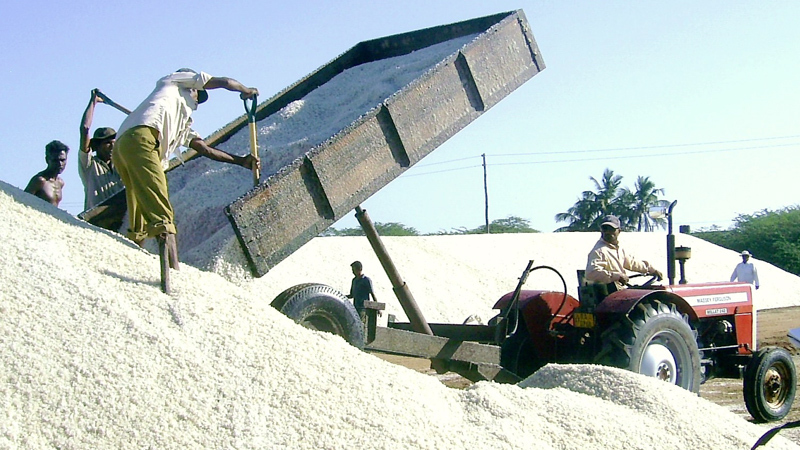 The harvesting of salt this year at Hambantota, Palatupana, Koholankala, and Bundala began recently. The ceremonial launch was held amid religious ceremonies at the Hambantota saltern. Salt Corporation Chairman Ayub Khan and the Board of Directors were present on the occasion. The targeted salt harvest from the Hambantota saltern is 54,000 metric tons, while the Bundala saltern expects 19,000 metric tons while the Palatupana saltern expects 17,000 metric tons, according to General Manager Sunil Ariyasena. He said the quantity would exceed due to the climatic condition in the Hambantota district at present which is conducive to salt production. He said in 2014, there was a salt harvest of 60,000 metric tons and that rose to 96,000 metric tons due to the upgrading of the three salterns. Ariyasena said 120,000 MT of salt is required for consumption and 30,000 metric tons is required for industrial purposes.